On November 30, 2018, at 11:00, the Valdai Club will host an expert discussion on the agenda of the G20 Summit in Argentina, which begins on the same day. The G20 represents 85% of the global GDP and 66% of the world’s population. 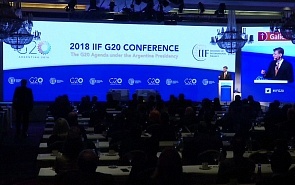 Ten years ago, at the height of the global financial crisis, the G20 acted as the most important platform for dialogue on global development with participation of leaders from both the developed and developing worlds. The current situation of trade wars, sanctions, protectionism and political tensions in various regions of the world requires a prompt response of world leaders in search for a new formula to solve vital problems. How efficient is the G20 today? Can the G20 contribute to solving global problems? Should there be an alternative to the G20? Does the organization need a sort of rebranding? The discussion participants will address these and other questions. Yaroslav Lissovolik, Programme Director of the Valdai Discussion Club.